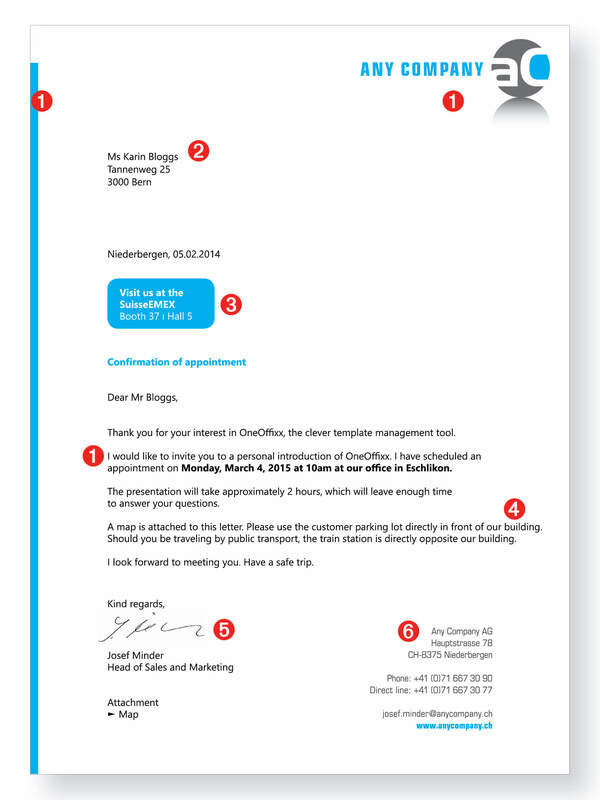 OneOffixx for Word templates: From zero to Office hero with OneOffixx! Simply professional: OneOffixx optimizes and simplifies your Word templates. For each type of document only one Word template is created. The centralized data administration guarantees a unified corporate identity on all documents. Template chaos is now a thing of the past: From the very beginning each employee, department and company location has access to centralized Word templates in accordance with the defined access rights. You will simply love it: OneOffixx makes working with Microsoft Office and other Office programs not only faster, better and easier...but also more fun! The OneOffixx Word templates eliminate many errors right from the beginning. Special tools, such as text modules, additional resources for marketing campaigns and signatory regulations facilitate your office routine. OneOffixx is simply user-friendly: To get started, no significant staff training is needed. Employees have more time to focus on their main tasks and essential workflows. From zero to Office hero with OneOffixx! Comprehensive layout hierarchy: style sheets → format layouts → master layouts → templates. Private and commonly used text blocks with drag & drop function. Comprehensive profile management and access right systems with access regulations for signatures, contact data etc. Envelopes, labels and address sheets can easily be created via the wizard by entering the data only once. Data-based content management, e.g. for labelling files and registers for users and organization entities. Creation of multiple letters and contracts with 1-6 addresses. Mail merge in a perfectly unified corprorate design based on external address lists. Includes a "Send in advance as PDF" wizard. Possibility of saving documents on the file server, in SharePoint, in DMS or in a cloud, including all relevant meta data. Word layouts are maintained directly in Word using the what-you-see-is-what-you-get principle. Possibility of creating branch-specific documents e.g. for regional governments or law firms (circular resolutions, governmental notifications, decrees etc. ).